Legal services in Myanmar are provided by Dentons Myanmar Limited. Dentons Myanmar Limited is a wholly-owned subsidiary of Dentons Rodyk & Davidson LLP, a limited liability partnership registered in Singapore with Registration No. T07LL0439G. You have been directed to this Policy because you are or may be providing personal data to DML. In this Policy, “we”, “us” or “our” refers to DML and Dentons Rodyk. This Policy applies to all personal data that you may provide to DML. By providing DML with personal data, you shall be deemed to have agreed to DML sharing the personal data with Dentons Rodyk, and to the terms in this Policy. Please do not provide us with any personal data if you do not agree to the terms in this Policy. In your interaction with us, you may be providing us with personal data such as your name, address, birthdate, email address, telephone number and any other information which can identify you or some other person. resolving any problems or disputes you may encounter in relation to our services. 2.3. Dentons Rodyk is a member of a Swiss Verein with members in different locations. For a list of the legal practices which are part of the Swiss Verein, see www.dentons.com/legalnotices. You agree that we may disclose the personal data you provide to us to the members of the Swiss Verein for the purpose of providing services to you, conducting conflict checks and marketing the services of the Swiss Verein members to you and for the purposes set out in Paragraph 2.2. You also agree that members of the Swiss Verein may also use the personal data for the purposes set out in Paragraph 2.2. 2.4 If we need to use your personal data for any other purposes, we will notify you and obtain your consent beforehand. You will be given the opportunity to withhold or withdraw your consent for the use of your personal data for these other purposes. 3.1 We will only disclose your personal data to third parties where you have provided us consent, and in the situations expressly set out in in this Policy. service providers, legal associates and data processors working on our behalf and providing services such as commercial investigative work, hosting and maintenance services, analysis services, e-mail messaging services, delivery and courier services, handling of payment transactions, due diligence checks, etc. our consultants and professional advisers (such as accountants and auditors). 3.3 You agree that we may transfer your personal data to any location outside of Singapore for the purposes set out in this Policy. If we do so, we will ensure that such personal data is protected to a standard comparable to the protection accorded to personal data under the Personal Data Protection Act 2012 (No. 26 of 2012) of Singapore. 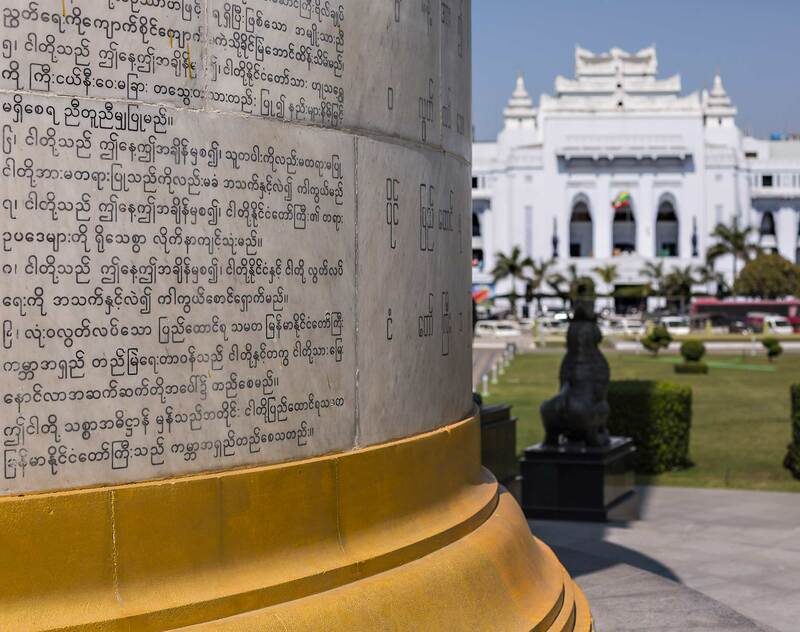 We may amend this Policy from time to time and the amended Policy will be published on http://www.dentons.com/en/legal-notices/myanmar.aspx. Your continued interaction with us indicates your acceptance of the amended Policy, which will apply to all personal data previously provided to us. 7.2 We will endeavor to respond to your request within 30 days, and if that is not possible, we will inform you of the time by which we will respond to you. 7.3 We may be prevented by law from complying with any request that you may make. We may also decline any request that you may make if the law permits us to do so. 7.4 In many circumstances, we need to use your personal data in order for us to provide our services and/or fulfill our scope of engagement. If you do not provide us with the required personal data, or if you do not accept the amended Policy or withdraw your consent to our use and/or disclosure of your personal data for these purposes, it may not be possible for us to continue to serve you or fulfill our scope of engagement. 7.5 We may charge you a fee for responding to your request for access to the personal data which we hold about you, or for information about the ways in which we have (or may have) used your personal data. If a fee is to be charged, we will inform you of the amount beforehand and respond to your request after payment is received. This Policy is governed by the laws of Singapore.